Rachel Lake, founder of Takeout Kit, loved cooking and was a huge fan of meal kits, but hated constantly wasting them because of her busy lifestyle. That’s why, in June 2016, she founded Takeout Kit. 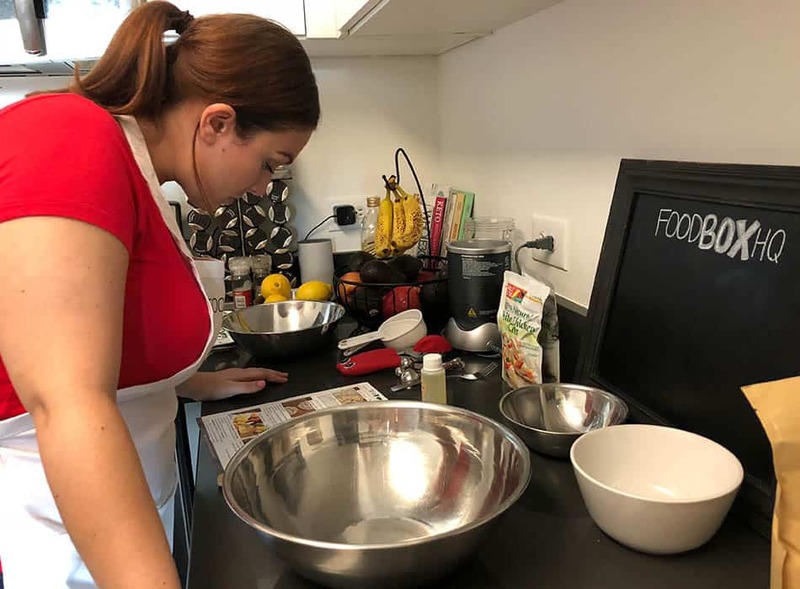 This meal delivery service is designed around those with busy lifestyles like new parents, college students, and working professionals. What makes them unique is that all of the meals they send you are easy-to-prepare and shelf-stable. For anyone looking to try new meals, but worried about the time constraint of a meal kit, Takeout Kit could be a great option. Takeout Kit makes it simple to subscribe to their service. First you need to choose your plan. They offer a few different options from 1-month to 12-month subscriptions. From there, you choose which takeout meal you would prefer. After that, on the 15th of every month you choose your next kit. Surprisingly, they have an eclectic mix of international dishes to choose from and are constantly adding more. In addition to their subscription services, you can buy individual or 3-meal sampler packs. This allows for flexibility if you’d rather try them out before subscribing. This isn’t something you usually see from meal kits. 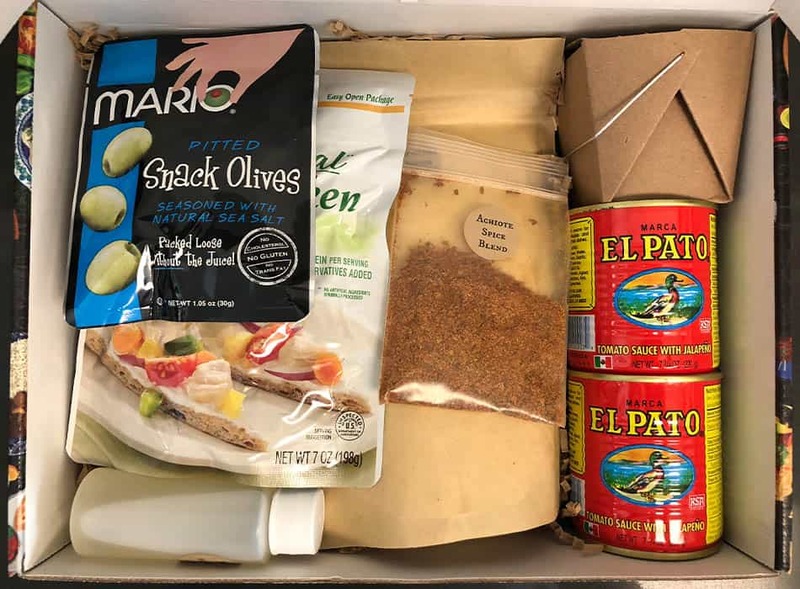 As mentioned above, Takeout Kit offers a surprising amount of variety to the meal kits they send. You’re not going to get plain sandwiches or burgers — plan on experiencing some new creations. In our kit we received Argentinian Empanadas, Italian Truffle Risotto, and Indian Butter Chicken. If you’re not into any of the meals we decided to go with, don’t fret! They have a ton more options… Spanish Paella with Chorizo, Indian Chicken Tikka Masala, and Thai Crab Curry are great protein-packed options. The Sichuan Mapo Tofu, Burmese Curry Noodles, Indian Chickpea Tikka Masala are great vegetarian options. Having the ability to conveniently select your preferred meal every month ensures that you get only the dishes you want. And, Takeout Kits are clearly designed for a multitude of diet and taste preferences. Just select the meals that you want to try, store them away and cook them up when you need a quick meal. This allows you to try something new on your own schedule, without having to worry about buying the wrong ingredients. Free shipping is offered for all Takeout Kits and they are delivered by USPS or FedEx. West Coast orders are delivered within 2-4 business days and East Coast orders are delivered within 4-6. Subscriptions bill on the 15th of each month and ship on the following 1st of the month. New subscriptions purchased between the 1-15th will ship on the following 1st of the month, unless requested earlier. Because these kits have a two-month shelf life, you don’t have to be home when they’re delivered (a huge plus) and the kits ship to every state in the US. This is a monthly delivery service, but if you ever want to add on extra meals to your regularly-scheduled meal, they make it easy to do so. Takeout Kits are delivered in a sealed cardboard box. 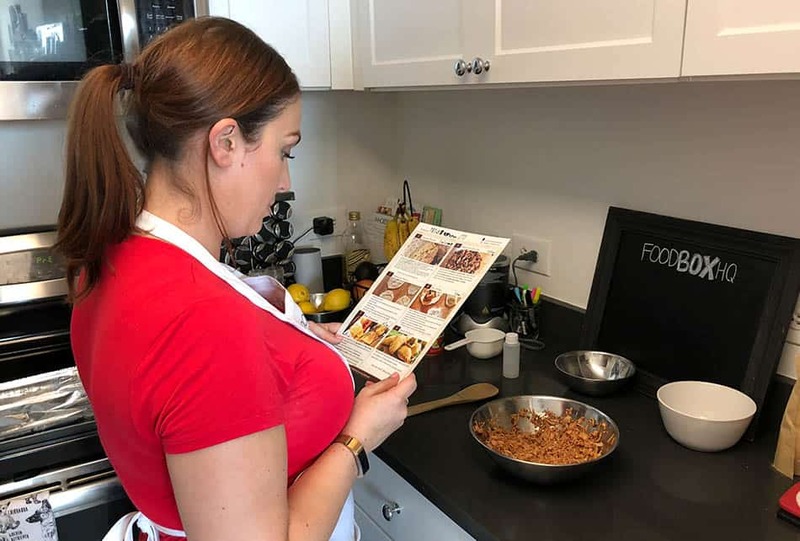 In each kit, you’ll find a “full meal experience” starting with the background of the dish, recipe card, global ingredients and a list of necessary kitchen supplies. They also provide suggestions for optional add-ins and drink pairings — a nice added touch. I was skeptical at first of how fresh Takeout Kits food would be. After all, it would be easy for them to just sell expensive boxed meals with random pre-packaged ingredients. This is not the case though. According to their website, Takeout Kit’s ingredient partners are USDA Certified Organic (when possible) and preservative-free. The only issue that may be of concern for some people is the amount of sodium. Specifically, in the chicken, there was 945mg in the whole bag we used. However, the meal did make 4 servings, so it’s not too bad. In general, higher amounts of sodium are usually foods to give them a longer shelf life. That’s the trade-off you make with Takeout Kit — higher sodium, prepackaged ingredients for meals on your schedule. It’s specifically designed for those who don’t always have the time to cook perishable meal kits. So if you strive to eat the absolute freshest ingredients, you may want to go with a different meal kit. All the ingredients in Takeout Kit come with, what we found to be, an easy-to-follow recipe card. What we liked most about the card is that it shows step-by-step instructions on how to make each dish, along with images of what you should be doing at each step. The instructions even include directions on how to open items! 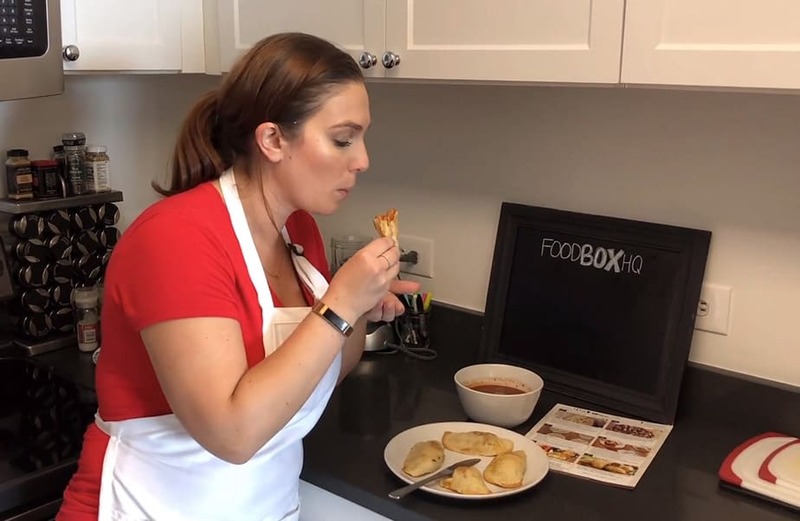 In our video review, you’ll see that we cook the empanadas, which are supposedly the most involved meal on their site to make. We did that on purpose. Our goal was to see if we could make their toughest-to-make meal and see if it actually tasted good. While the meal had a lot of steps, it wasn’t too tough to make. In fact, we found it to be quite fun! Especially considering we’ve never made empanadas before. You may be a bit skeptical thinking about how these meals taste. I know I was before we cooked our first meal. The truth is, it would be very easy for Takeout Kit meals to just taste like regular pre-packaged or frozen meals — they don’t. 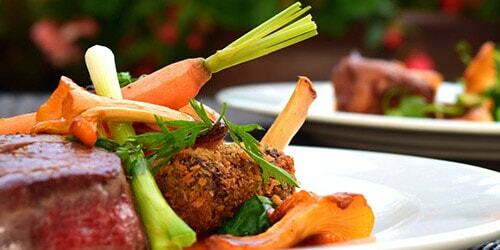 You get the tastiness of a home cooked meal, without having to sacrifice your schedule. The empanadas we made came out surprisingly well. I say “surprisingly” because this was the first time we ever made this dish. Even though we flubbed a few of them when putting together the dough, after they came out of the oven, they tasted great. Takeout Kit is a monthly subscription service that feeds 3-4 people. It is $32/month for 1 kit, $62/month for 2 kits, or $90/month for three kits. You get additional savings by becoming a 3, 6 or 12-month subscriber: the 3-month plan is $93; the 6-month plan is $180; and the 12-month plan is $348. They also have 3-pack samplers for $85-$105 – bestsellers, vegetarian, meat-lovers, spicy food lovers and adventure seekers. If you just want to buy individual kits, it is $30 for vegetarian kits and $35 for meat-based kits. When I first heard of the Takeout Kit, I thought it sounded like a more expensive version of a boxed meal from the grocery store, but that’s not the case at all. Takeout Kit meals are a great alternative to traditional meal kits, or even great to use in addition to using a traditional meal kit (for a “just in case” scenario). 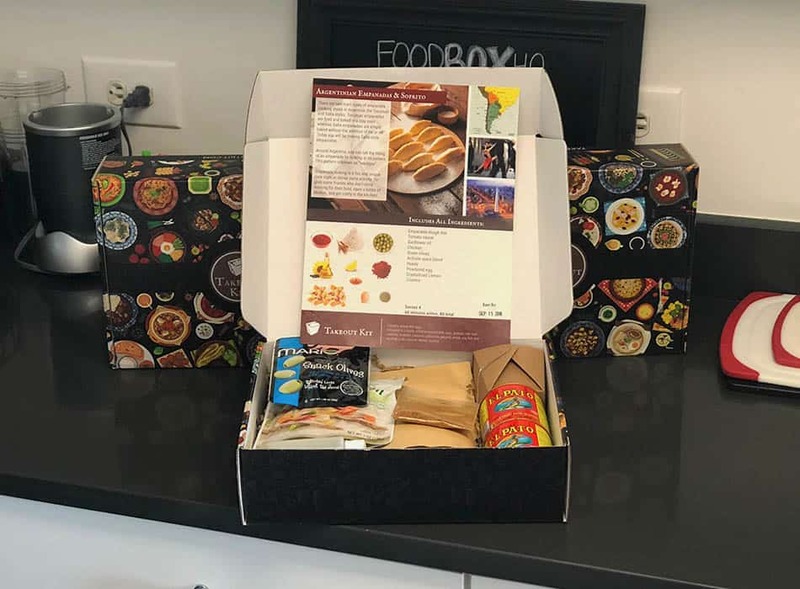 If you live a busy lifestyle and don’t necessarily want to be burdened with cooking perishable meals on a regular basis, or are just looking to try cooking some more adventurous food, then Takeout Kit is a great option for you!